With the outbreak of WWII on 1 September 1939, the Germans invaded Poland, and on 5 September they conquered Płońsk. At the beginning of October 1939, the city was annexed to the Bezirk Zichenau (Ciechanów region), its name changed to Plohnen, and military rule replaced with civilian rule. Many Jews fled from Płońsk to Warsaw and the Soviet territories. 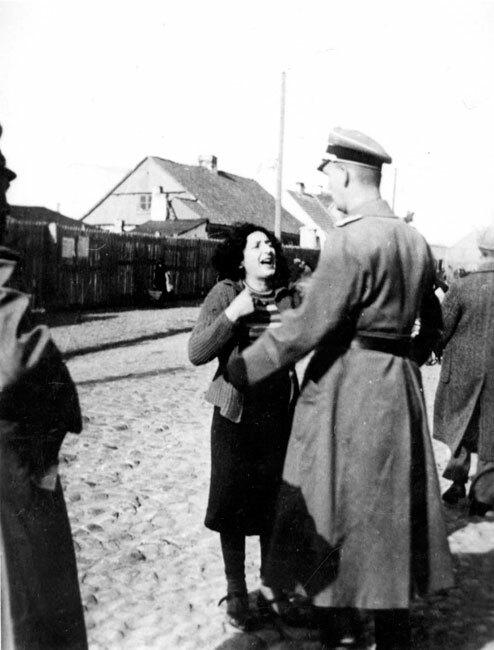 On entering Płońsk, the Germans plundered a number of Jewish stores – the pharmacy of Hirsch Nanas and two jewelry stores belonging to Szeprling and Grünbaum – and a few days later began to abuse and humiliate the city's Jews. 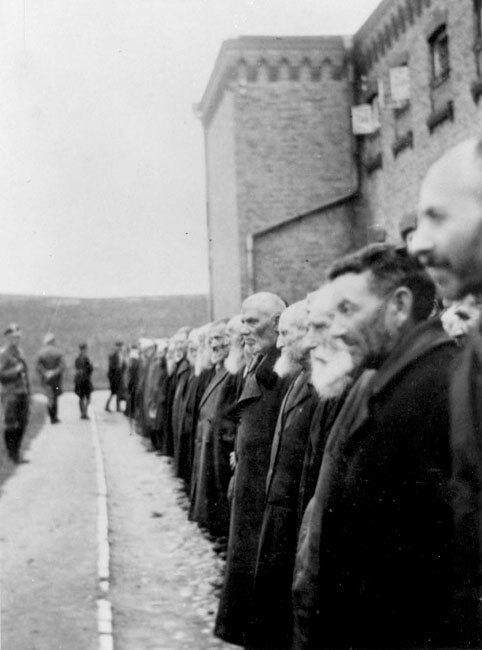 On 19 September 1939, the Germans brought all the Jewish men aged 16 and over to the prison courtyard and registered their names. 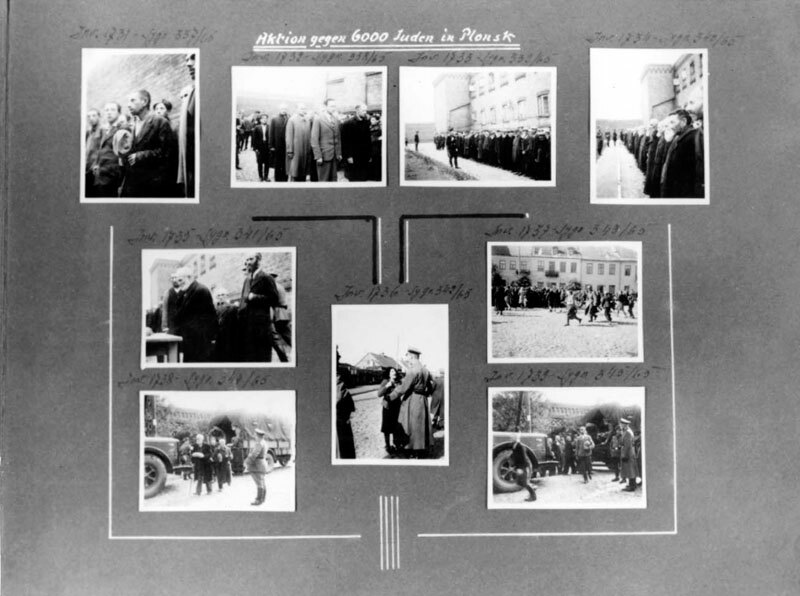 The registration process was accompanied by brutal beatings, recorded by German photographers. Gestapo men came from Płock and took 17 Jews and some 40 Poles hostage, among them Mayor Pioterkowski, the regional doctor, teachers and priests. All but one were shot. Almost all the men presented themselves at the appointed time [9am on 19 September], not possibly knowing what awaited them. Mother even encouraged Father and I not to be late… when we crossed the prison courtyard I saw the Gestapo men standing around, roaring at the tops of their voices and kicking people with their boots… at the end of the registration we were ordered once more to stand in a line along the length of the square and the Germans came around and pointed at those they chose… in the end 17 men were taken hostage at the prison. They put them into two cells: nine in one and eight in the other. In my cell were Posnansky, the two Yakobowicz brothers, owners of the large grocery store, the Jewish community secretary Levi, the mill owner Ephraim Bogati, Avraham Katz, Staroswiecki's father-in-law, Moshkowicz the painter, and Glicksman. In the other cell were, among others, Nanas, Staroswiecki, Dasar the lawyer, Kasman the wagon trader, and rabbis. The Germans randomly recruited Jews for forced labor, and the Jewish hostages were responsible for ensuring that the laborers left in an organized fashion for work, as well as for the appearance of those registered for "gymnastics" twice a week. 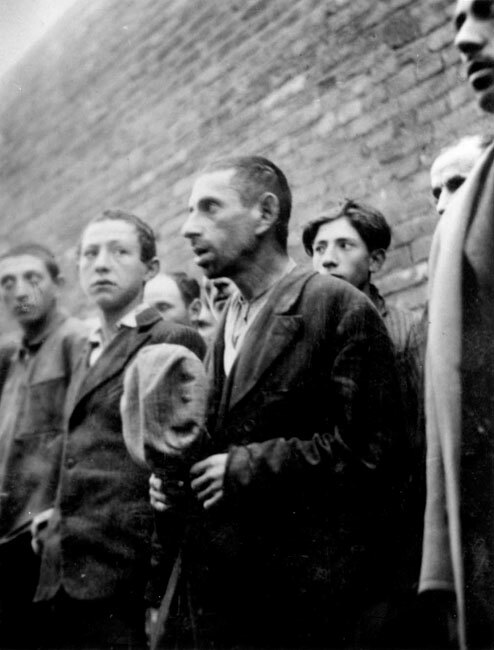 At the end of September or beginning of October 1939, during one of the forced "gymnastics" days, 200 Jews were taken out of the city towards the border with the Soviet Union, and some of them were murdered. In November, the Jewish community paid a ransom of 100,000 Zloty, and the hostages were released. Later, the Germans authorized Avraham Levy, who was in charge of the office for writing requests and signs in German, to prepare the list of workers. 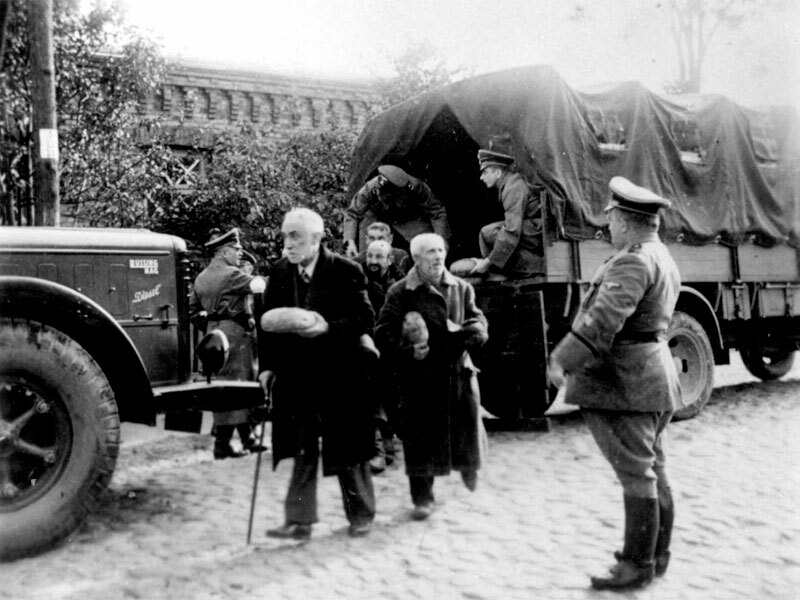 In the fall of 1939, Jews that had been deported from cities annexed to the Third Reich – Lypno, Sierpc, Ripin and more – as well as those from the settlements around Płońsk arrived in the city. 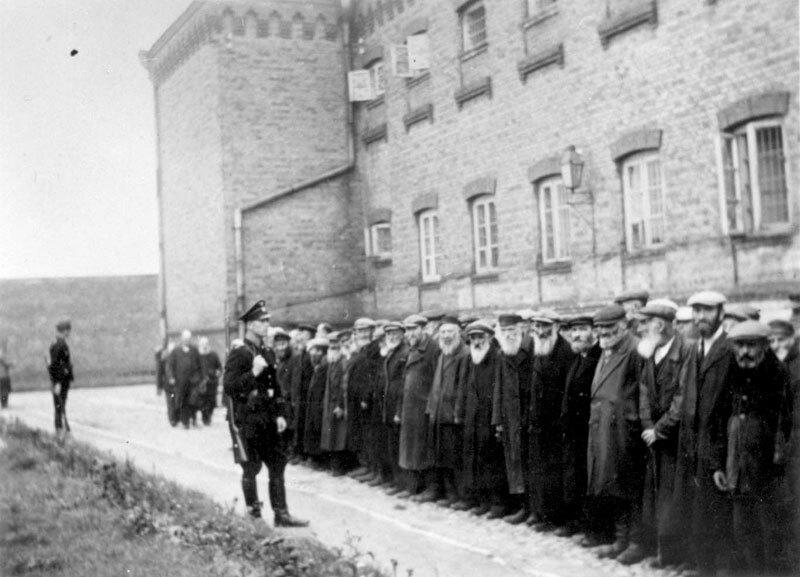 At the same time, the Jews of Płońsk were ordered to don the Yellow Star. After a while, they were ordered to add the word "Jude" (Jew) to the Star. They were forbidden from walking in the street after 6pm, and ordered to pay all their dues from the years before the war to the municipal coffers. All the manifestations of a sound public life were quickly strangled by the Germans. It was impossible to meet in the street without being suspected of subversion… all cultural and religious activities were forbidden by order of the occupiers. The shteibel on Płocka Street was open until December 1939. There Zelig Sznicer, Avraham Posnansky and Simcha Kalmonowsky would sit together to learn. Despite this, the Gur shteibel was pulled down immediately after the Germans entered the city. The Great Synagogue was destroyed, together with the artworks and Torah scrolls within. The building was turned into an egg warehouse by the Germans. The Old Beit Midrash on Warsaw Street was destroyed. 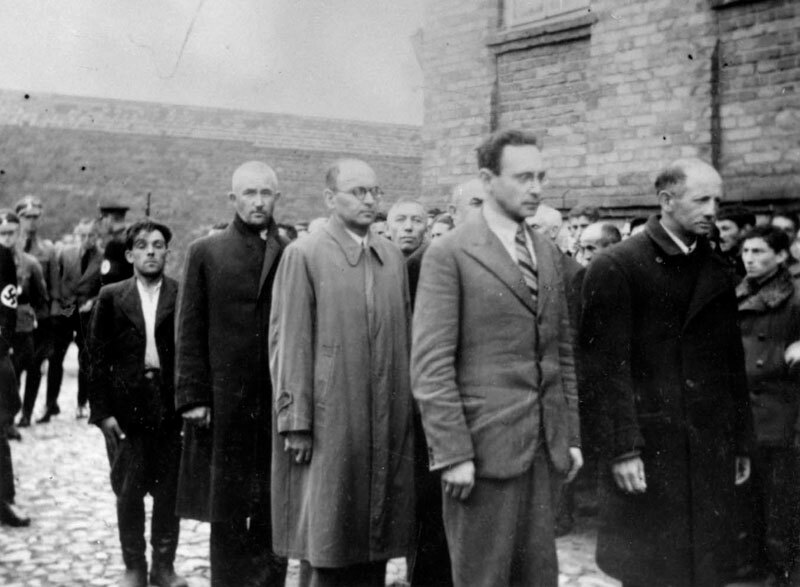 In the fall of 1939, an aid committee was set up in Płońsk for needy Jews, mostly the thousands of refugees that arrived in the city completely destitute. The committee was run by Shlomo Bogati, the owner of the former flour mill, and his deputy Yaakov Grabman. 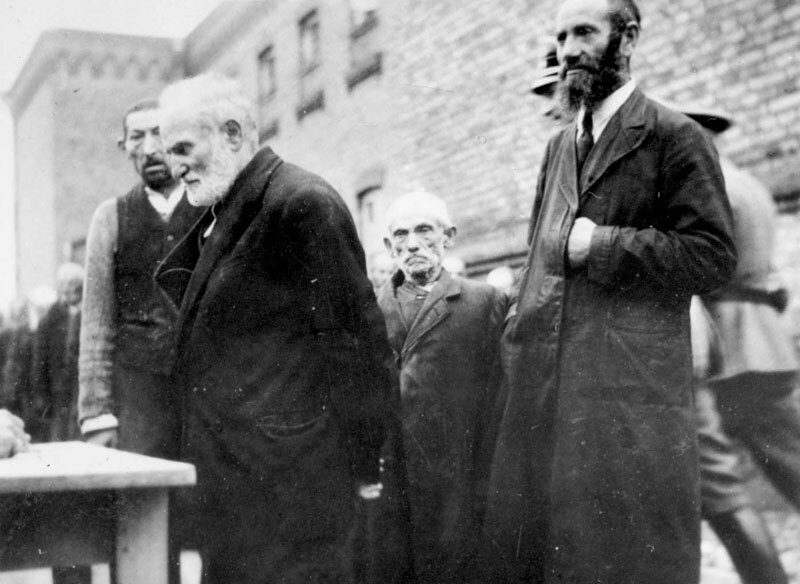 Also on the committee were Ephraim Levi, the secretary, Raksler, the treasurer, and representatives of the refugees from the various cities. The committee collected donations from the wealthy residents of the city. It also received food and money from time to time from the "Joint" in Warsaw, until the end of 1940. During 1940, it seems that all the Jewish businesses in Płońsk were confiscated. During 1940-1941, many Jews that had fled the city to Warsaw at the beginning of the war returned to Płońsk, as well as others from the surrounding settlements and those that had been annexed to the territory of the Reich. 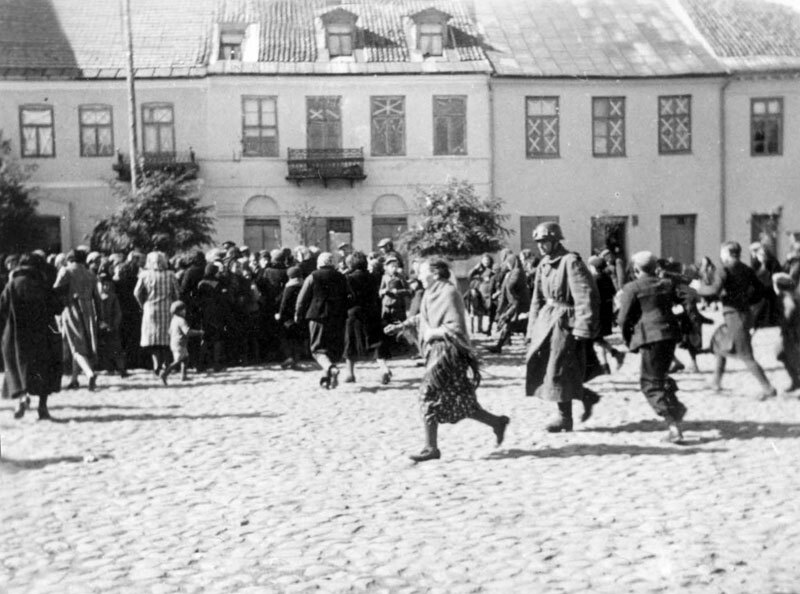 In September-December 1940, Płońsk had 7,000-8,000 Jews, of which 3,800 were refugees.